In this lesson, we will learn how to calculate the area of a rectangle and use it to solve problems in real-life situations. Find the width of a rectangle whose area is 104 cm2 and length is 13 cm. Find the area of rectangle 𝐴 𝐵 𝐶 𝐷 . The outdoor Olympic swimming pool in Volos, Greece, is 50 metres long and 25 metres wide. What is the area of the pool? A rectangle has an area of 6.95 cm2 and a width of 1.75 cm. What is the length of the rectangle? Give your answer correct to the nearest hundredth. The area of a square with a length of 14 cm is the area of a rectangle with dimensions 12 cm and 15 cm. Find the area of a rectangle with a length of 10 cm and a perimeter of 28 cm. The area of a square is equal to the area of a rectangle whose dimensions are 18 cm by 8 cm. Calculate the side length of the square. A man bought a square-shaped piece of land with perimeter 168 m. If he builds a house on the land that measures 46 m by 38 m, how much area is left for the garden? Regulation volleyball courts are 18 metres long and 9 metres wide. Additionally, a free zone extends from two of the sides as shown in the figure. Given that the width of each free zone is 3 metres, find the combined area of the volleyball court and the free zones. Mrs. Adam wants to renew the flooring in her living room that is 13 by 18 feet. What is the area of her living room? Which of the following represents the dimensions of two different rectangles that have the same area? The area of Nada’s room is 432 square feet. If the room is 24 feet long, find its width. A high school basketball court is a rectangle measuring 84 feet by 50 feet. What is the area of a high school basketball court? Milos has a backyard with two separate green areas as shown in the figure. If each green area is a square with a side length of 𝑥 ft, determine an expression to represent the area of the space around the two green areas. If a square and a rectangle have the same perimeter, and the rectangle measures 4 cm by 14 cm, what is the area of the square? Rectangular tiles measure 30 cm by 20 cm. How many tiles are needed to cover a square floor with length 60 m? Find the area of the given figure to the nearest tenth. Calculate the area of a rectangle with a perimeter equal to 94 cm and one side of length 37 cm. The sum of the perimeters of a rectangle and a square is 138 cm. The width of the rectangle and the length of the square both equal 16 cm. Find the perimeter and the area of the rectangle. APerimeter: 74 cm. Area: 336 cm2. BPerimeter: 64 cm. Area: 256 cm2. CPerimeter: 106 cm. Area: 296 cm2. DPerimeter: 122 cm. Area: 441 cm2. Nabil wants to tile the floor of a rectangular room measuring 1 m by 8 m. If the tiles are square, with length 20 cm, how many will he need? Given that the area of a rectangle is 1 680 cm2, and its width is 24 cm, find the length of its diagonal. 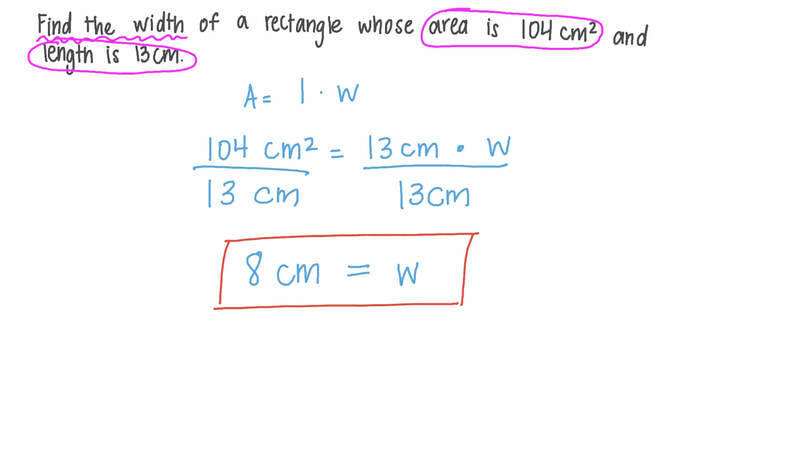 Find the area of the rectangle giving the answer to the nearest square centimetre. If the width of a rectangle is half its length, and the rectangle’s area is 963 square meters, determine its perimeter to the nearest tenth. Calculate the area of a rectangle whose perimeter is 36 cm and width is 5 cm. The area of a rectangle is 234 cm2, and its width is 13 cm. Calculate its length, and its perimeter. A Length: 18 cm. Perimeter: 62 cm. B Length: 18 cm. Perimeter: 31 cm. C Length: 26 cm. Perimeter: 78 cm. D Length: 26 cm. Perimeter: 338 cm. E Length: 26 cm. Perimeter: 39 cm.